I have been so lucky to get to photograph this beautiful mother / daughter duo again! Our first session was back in 2013 so it was really fun for me to see how much miss J has grown up since she was just a baby during our first session. This is one of my favorite shots of her and mom snuggled together at my Glen Rock photo studio. I love the simple and classic grey backdrop with their blue-toned tops. 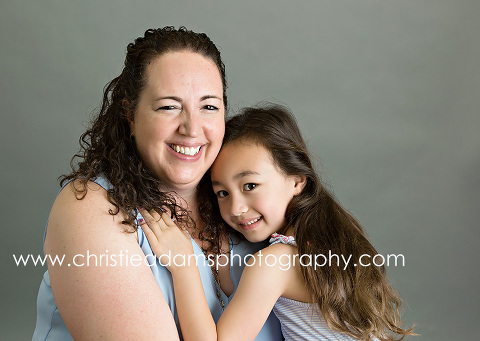 Christie Adams Photography has been in business for 11 years as a Bergen county family photographer and has a studio in downtown Glen Rock NJ. The studio specializes in timeless and classic portraits where the focus is always on your family and NOT elaborate props, backdrops or a “set,” By using minimal props your images will stand the test of time and like just as lovely on display in your home decades from now as they do today. The studio is currently booking outdoor as well as in-studio sessions through August. If you are searching for a classic photographer in Northern NJ I would love to chat about a photo session with your family this summer!